The recent terrible floods along the North Sea coast on England and inland too, reminds me of this film and I will tell you why. 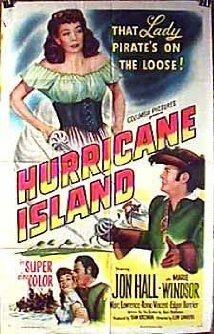 A man I know in the local pub is originally from a village near Mablethorpe a seaside town in Lincolnshire, England and he told me the story of going to the local cinema in the town on a night in 1953 to see Hurricane Island with Jon Hall. Mid way through the performance the film stopped and water began coming into the cinema so they all got out safely. He lived inland and on higher ground so was able to leave the town quite easily, but there was loss of life there that night sadly due to the sea flooding along the whole of that coast and down to Norfolk as well. The film was showing at The Lyric – now no longer a cinema like so many more. He did tell me that he has never seen the end of that film because it has not been on television or shown since. He became a leading man, and freelanced for several studios, appearing in South of Pago Pago, Kit Carson (both 1940), Aloma of the South Seas (1941), and Eagle Squadron (1942), before being paired with exotic Maria Montez in a Technicolor spectacle for Universal, Arabian Nights (1942). Escape-hungry wartime audiences made it a big hit, and Universal kept the Hall-Montez team together in White Savage (1943), Ali Baba and the Forty Thieves, Cobra Woman, GypsyWildcat (all 1944), and Sudan (1945). When the formula finally petered out, Hall’s star began to wane. He made several Westerns, among them The Vigilantes Return (1947), Deputy Marshal (1949, costarring then-wife Frances Langford), and When the Redskins Rode (1951), before starring as “Ramar of the Jungle” in a 1952-54 syndicated TV series, some episodes of which were cut together and released as feature films. Overweight and lethargic, he never regained his box-office standing, although he did stay in the movie business by renting out some expensive photographic equipment he’d collected over the years. He also directed one film, The Beachgirls and the Monster (1965, aka Monster from the Surf Hall married actress Raquel Torres in 1959, and shot himself after spending several months in bed following an operation for bladder cancer. Jon was an inventor and highly skilled aviator. He held patents on an underwater camera, optivision lenses and the design of the hulls of PT boats for the US Navy. Jon Hall has two stars on the Hollywood Walk of Fame, for Motion Pictures at 1724 Vine Street and for television at 6933 Hollywood Boulevard.